Where Is the Halliburton Stock Price Headed in 2015? Subject: Where Is the Halliburton Stock Price Headed in 2015? The Halliburton stock price has beaten the S&P 500 energy sector by 14.7% this year. In 2015, Halliburton Co. (NYSE: HAL) stock is up 17.6%, and shares currently trade near $45.60. HAL stock has surged 5.4% this quarter despite coming off the energy sector's worst earnings season in years due to crashing oil prices. According to FactSet, Q1 earnings across the sector saw an average year-over-year decline of 64.4%. That's the largest loss out of all 10 sectors on the S&P 500. Halliburton's April 20 earnings report followed that trend. The company posted earnings per share (EPS) of $0.49, down 33% from $0.73 in Q1 2014. Revenue fell 2.7% to $7.1 billion over the same period. But its lackluster earnings were nowhere near as bad as firms like BP Plc. (NYSE ADR: BP), Total SA (NYSE ADR: TOT), and Exxon Mobil Corp. (NYSE: XOM). That's been a huge win for HAL, which is one of the few large oil stocks trading up so far this year. 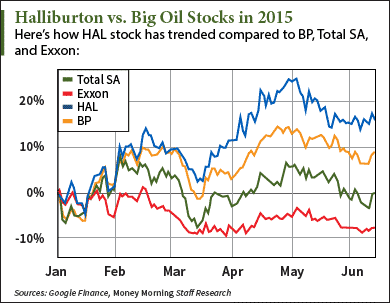 How Does the Halliburton Stock Price Compare to Other Big Oil Stocks? "Big Oil" is a term used to describe the world's largest publicly owned energy companies. These companies – or "supermajors" – include BP, Total, and Exxon. HAL stock has soared over all of them in 2015. The Halliburton stock price has increased 17.6% since Dec. 31, 2014. That's 8.7% more than BP, whose Q1 profits fell 40%. BP's cash flow also plummeted more than 75%. BP was the first Big Oil company to release Q1 earnings on April 28. Since then, BP stock has dipped 4.7%. Meanwhile, Exxon and Total SA have slipped 8% and 0.3% this year. Exxon — the world's largest publicly traded oil company — saw a 46% earnings loss and a 36.7% revenue loss. Total's earnings were 48% lower than last year's earnings of $1.46 per share. It's clear Halliburton is more profitable than most of the supermajors right now. The 38% drop in WTI oil prices over the past year has hurt the exploration and production firms more than oilfield service (OFS) companies. But does that make Halliburton stock a buy? Should I Buy at the Current Halliburton Stock Price of $45.60?